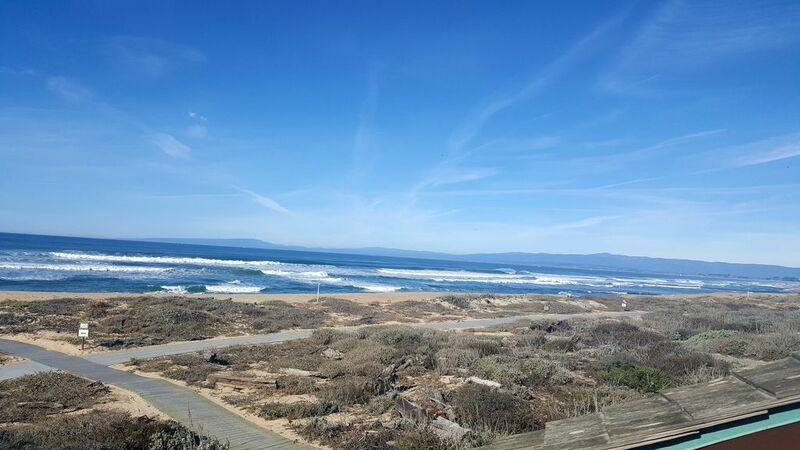 The secluded, gated community known as Monterey Dunes Colony offers this beachfront luxury home for your pleasure. The home offers 4 BR and 3 1/2 BA situated in 2,500 sq. ft. of living area on two levels. Two decks on the home, non-Oceanside and Oceanside. This luxurious home features: a wood burning fireplace (firewood furnished), free WIFI, satellite TVs, Bluray DVD players, stereo CD/radio (Ipod-Iphone connection), four flat screen TVs (two web enabled), full kitchen, two refrigerators, disposal, dishwasher and microwave. Portable crib/playpen plus high chair for infants. Two car garage, washer and dryer are furnished with the home. The complex where the home is located is gated. There are four tennis courts, swimming pool, hot tub, basketball court, pitch and putt practice area, bocce ball court and shuffleboard courts. Luxury for eight, maximum capacity nine. Amenities: Outdoor Community Spa, Swimming Pool, Four Tennis Courts, Weber Charcoal Grill, Pitch and Putt, Basketball Court, Bocce Ball Court, Shuffleboard Court, Full Kitchen, TV's, Satellite, Bluray DVD player, Washer/Dryer & Dishwasher, Stereo/CD/radio/iPod/iPhone player, Fireplace, Two-Car garage, Completely Furnished, Linens and Dishes/Utensils. Twenty Golf courses within 20 miles, including world-famous Pebble Beach as well as the Links at Spanish Bay, Cypress, Poppy Hills, Black Horse, Bayonet and Rancho Canada. Activities: Anything you can do at the beach you can do here. Swimming, boating, fishing, kayaking, rollerblading, hiking, bird watching at Elkhorn Bird Sanctuary, running, bicycling, beachcombing, surfing, snorkeling, scuba diving and sailing. Area: Monterey Bay is the location of the Monterey Bay Aquarium, Laguna Seca Race Course, Pebble Beach, 17-mile Drive, National Steinbeck Center, Carmel and Cannery Row. Bathrooms have doors 28 inches wide, too narrow to admit many wheelchairs. Pool heated from Easter to October, bathroom not accessible by wheel chair if over 28' wide. Firewood is supplied, charcoal for the grill is not. Paper towels, liquid soap, toilet paper and Kleenex supplied. Twenty golf courses within 20 minutes, Monterey Bay Aquarium, Cannery Row, Pebble Beach, Carmel.